For super-lightweight alpine traveling, the bivy sack takes the place of a tent in providing shelter from wind and rain. The sack is a large envelope of tightly woven fabric with a zipper entrance at one end. The bottom, usually of waterproof coated nylon, goes against an insulating ground pad. The upper side, of a breathable, waterproof material such as Gore-Tex, allows moisture to escape into the atmosphere. The bivy sack is designed for one person, two in an emergency. It needs no poles or stakes, but usually has strong loops for anchoring and can be used by itself or to add extra warmth to a sleeping bag. Newcomers to snow camping are sometimes surprised at what a warm, comfortable, and beautiful experience it can be. To make it work, a good shelter and insulation are essential. At the very least, every snow traveler needs the skills and equipment to survive overnight in the snow. The most convenient snow shelter is a tent installed on a stamped-out platform slightly larger than the tent floor. It's easy to put up and gets you quickly out of the elements. When conditions are serious, a tent can shelter double to triple the usual number of occupants. There are a few tricks to anchoring a tent in snow, where metal or plastic stakes can melt out during the day. Stakes can be replaced by "dead-man" anchors (fig. 3-4), such as a rock, a bag filled with rocks, or a nylon stuff sack filled with snow. 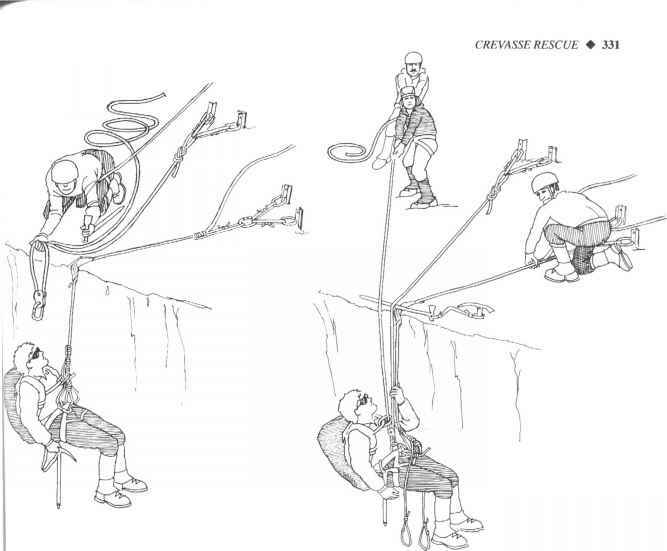 Attach a cord or sling to the deadman, bury the deadman in the snow, stamp down the snow above it, and then connect a tent guy line to the cord or sling. Stakes themselves can be used as deadman anchors by burying them horizontally in a snow trench, perpendicular to the guy line. Even better, prepare the deadman in advance by drilling holes in a stake or metal plate and attaching a bridle, to which the guy line can be tied. Snowshoes and ice axes also make solid anchors, but of course you can't use them for anything else while they're holding down the tent. Snow campers have to watch out that heavy, wet snow does not pile up on the tent or fly, because too much force can break rigging or tent poles and bring the whole structure down. A heavy snow load can even bury a tent and its occupants, asphyxiating them. Shake the walls and shovel out around the tent as often as necessary to keep a big load of snow off. A snow wall built around the tent helps give protection from blowing snow and heavy wind. A snow cave (fig. 3-5) provides more protection, comfort, and insulation from a storm than a flapping, gale-swept tent, and it's an emergency shelter when you have no tent. Knowing how to build snow caves is an essential mountaineering skill. Be prepared for the fact that it's a time-consuming job. Fig. 3-4. Deadman anchors: a, metal plate; b, tent stake; c, nylon stuff sack. grain scoop—a lightweight shovel with a very broad blade—can move a lot of snow, but it's difficult to use in tight quarters.) Holes can be drilled in the shovel base to make it lighter, without sacrificing its scooping power. Even with two shovels in the party, it can take 2 or 3 hours to dig a shelter for four people. Find a location. Look for obvious hazards. Are you on a potential avalanche slope? Could wind blow snow over the opening and seal you in? Look for fairly firm snow at least 6 feet deep. A short steep slope, such as along a riverbank or on the side of a snowdrift, makes for a better cave than trying to dig one on the flat. Get to work. Keep your clothing dry. Work slowly to avoid excessive sweating. Dig an entry way into the slope, far enough to start a tunnel. Continue to dig inward about 3 feet to form the entrance to the cave, then angle upward to excavate a living area. There should be at least 1 foot of snow on the slope above the cave ceiling to provide enough strength to keep it from collapsing. Put the cave floor above the top of the entry tunnel, in order to trap warm air inside. Make the ceiling smooth, with no bumps or protrusions, so melting snow will run down the walls rather than drip on the climbers. Put down a ground sheet to keep things dry and prevent loss of equipment in the snow. A small tarp over the entrance will help keep the weather out. Punch a ventilation hole through the ceiling. Enlarge the hole if it gets too warm inside. 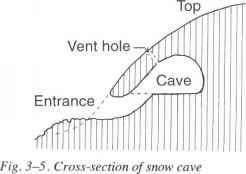 There is even a way to build an emergency snow cave in shallow powder snow (fig. 3-6). You need at least 6 inches of snow, and it takes about 3 hours. Step by step, this is the way to do it. Drive a 6-foot stick vertically into the snow. Take another and draw a circle 12 feet in diameter around the stake. Lay the second stick on the snow, one end touching the vertical stick. (The second stick becomes a "guide" to point you toward the vertical stick after you've buried it within the cave.) Shovel snow into a big pile within the circle, packing it down until its center is about 1 foot above the top of the vertical stick. Let the pile sit for an hour or so, then tunnel into the pile following the guide stick. Excavate enough snow to make a small room, large enough for two or three people, with 2-foot-thick walls. Remove the vertical stake. With a little improvisation, natural shelters can be converted into snow hideaways in an emergency. Such shelters occur under logs, along river-banks, or in the pits formed when snow melts and settles away from large trees. For a tree-pit shelter, enlarge the natural hole around the trunk and roof it with any available covering, such as ice blocks, tree limbs, or canvas. Boughs and bark can provide insulation (but don't cut live boughs unless it is a life-or-death emergency). When it is getting dark or the weather is especially bad, a snow-block shelter might be your answer. The trench igloo (fig. 3-7), built on either a slope or on the flat, is a quick emergency shelter for one or two people. Dig a narrow trench and then roof the trench, A-frame style, with snow blocks. 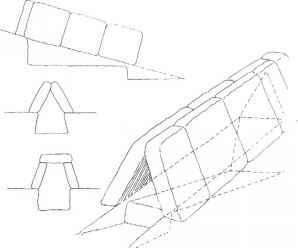 (The blocks can be created as part of the process of removing snow for the trench, or they can be quarried nearby.) Then enlarge the interior and provide a vent hole. Smooth out any irregularities in the ceiling so that condensation will run down the blocks and not drip on the occupants. This shelter is not as easy to build as it looks, so practice first in good weather. 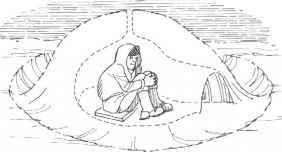 A more basic emergency snow shelter can be built by digging a trench some 4 to 6 feet deep and large enough for the party, then stretching a tarp over the top, perhaps gaining a slight angle by anchoring one side to a ridge of snow. This works well in wind or rain, but a heavy snowfall can collapse a roof that is so nearly flat. The smaller the trench, the easier it is to keep warm. Again, be sure to provide for ventilation. Fig. 3-8. Construction of a traditional igloo proper snow consistency or preparation, plus a builder with a good bit of expertise. Wet, packed snow provides blocks that stick together and stay in place, but makes them heavy and difficult to handle. Wind-packed snow is the easiest to work with. If the snow is soft, stomp it down and let it consolidate for a few minutes before starting to saw blocks with a snow saw or shovel. Each snow block should measure about 2'/2 feet by 11 /2 feet by 1 /2 foot. Bevel the bottom of each block so the wall will tilt inward at the proper angle. Hold each block in place as it is installed while the cracks are chinked with snow. 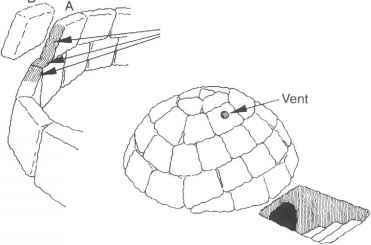 The igloo entrance should be below floor level so that warm air is trapped inside.